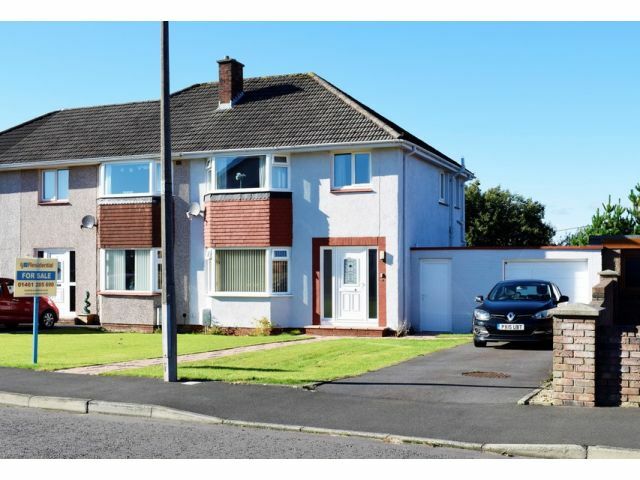 This three bedroom family home is located in a desirable residential area of the town of Annan, which has all amenities associated with a large town, including primary and secondary schooling, doctors surgeries, supermarkets and a leisure centre. Perfect family home requiring minimal modernisation! Comprising of Lounge open to Dining Room, Kitchen and Conservatory. Three Bedrooms (each with built in wardrobes) and Bathroom. Driveway, Garage and Lawn to front. Enclosed Rear Garden with Lawn & Paved Areas and Three Outhouses. Ceiling light, smoke alarm. Greensource air to air heat pump. Under stair storage cupboard. Radiator, carpeted flooring. Bay window to front with blinds. Coving, ceiling light, TV point, telephone point. Electric living flame fire set into feature brick surround. Radiator, carpeted flooring. Window to rear with curtain pole and blinds. Coving, ceiling light, radiator, carpeted flooring. Double glazed. Laminate flooring. Patio door to rear garden. Window to side with curtain pole. Loft access, ceiling light, smoke alarm. Carpeted flooring. Bay window to front. Ceiling light, built in wardrobe. Radiator, laminate flooring. Window to rear with curtain pole. Ceiling light, built in wardrobe. Radiator, laminate flooring. Window to front with curtain pole. Ceiling light, built in wardrobe. Radiator, carpeted flooring. Opaque window to side. Ceiling light, fully tiled walls. Three piece suite comprising of toilet, wash hand basin and bath. Radiator, tiled flooring. Tarmac driveway leading to garage. Front garden laid to lawn. Large enclosed rear garden with lawn and paved areas. Three brick built outhouses. Offers in the region of £145,000 are invited and should be submitted to lj Residential, 93 High Street, Annan, DG12 6DJ or by fax to: 01461 205037.